This idea comes from another existing design that is part of Yarnspirations that is called the Simple Baby Blanket. I’ve changed up the starting chain but the concept is the same which includes the border. This afghan plays with the idea of doing single crochet and ch 1. This creates ch-1 spaces which is where you play in the row above. Due to this effect, it makes the stitches look locked together and makes for a speedy process. This video will help you get started with crochet as well as cover the basics such as chaining and single crochet. 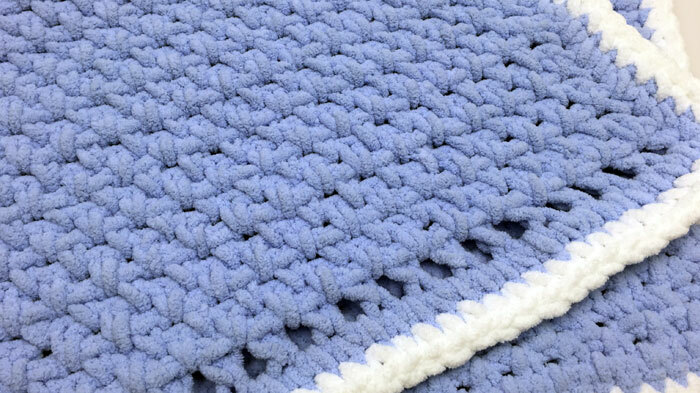 Using 10 mm or Size N crochet hook, you will get a 31″ wide by 34″ long baby blanket. This pattern is exceptionally simple. The stitches really connect well with each other too. Using Bernat Baby Blanket Baby Blue, chain 74. 1 single crochet (sc) in 2nd ch from hook. *Ch 1. Skip next ch. 1 sc in next ch. Repeat (rep) from * to end of chain. Turn. 2nd row: Ch 1. 1 sc in first sc. 1 sc in next ch-1 space (sp). *Ch 1. Skip next sc. 1 sc in next ch-1 sp. Rep from * to last sc. 1 sc in last sc. Turn. 3rd row: Ch 1. 1 sc in first sc. *Ch 1. Skip next sc. 1 sc in next ch-1 sp. Rep from * to last 2 sc. Ch 1. Skip next sc. 1 sc in last sc. Turn. Rep 2nd and 3rd rows for pattern (pat) until work from beginning (beg) until you run out of baby blue. Fasten off. You will notice there is a gap spaces on the one edge. That is for apply ribbon through the stitches if you prefer it. Up to you.